Angela Boyle ’53 Award for Service – Ursuline Academy – Celebrating 125 Years! The Angela Boyle ’53 Award for Service is presented to an alumna who demonstrates service to the community and who fully represents the Ursuline spirit. 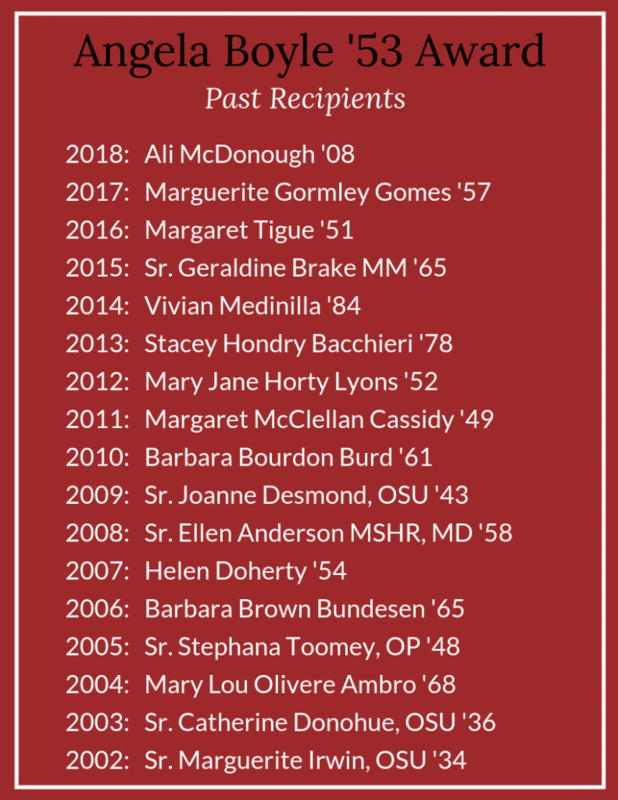 Given annually during the spring Alumnae Weekend luncheon, this award is one of the event’s highlights that is not only shared with the classmates of the recipient but family and friends alike. Angela Boyle’s history with Ursuline dates back to her graduation from the school in 1953. Post-graduation, Angela was a beloved English teacher at Ursuline for many years before becoming the Assistant Principal. Her devotion to the school continued as she was named the first lay President of Ursuline Academy. After years of continued dedication and service for Ursuline, this award was named as her legacy. Despite the distance, Angela remains active in the Ursuline sisterhood from her home in Florida. After her graduation from Ursuline in 1969, Denise attended the St Francis Hospital School of Nursing for her RN diploma. She had the distinction of being the first African American to graduate from this school. She received her BSN in Nursing and her master’s degree in Management. She joined Maternity at the General Division in 1974. By 1982, Denise was promoted to the role Head Nurse in maternity, the first African American to hold that position in that service. She continued in this role until her retirement in 2016. Denise remains the longest serving African American Nurse Manager in present Christiana Care Health Systems. Before she retired, Denise was kind enough to visit our students, and share stories about her career as a Nurse Manager of the Post-Partum unit. Making a lasting impression on so many of them, Denise has since become a precious resource to helping our students visit and shadow the Labor and Delivery Departments. In addition to her work at the hospital, Denise has been inducted into Sigma Theta Tau Sorority for nursing excellence. She was an adjunct instructor and mentor in the areas of Post-Partum, Labor and Delivery, and the NICU for 15 years, in addition to her fulltime position at the hospital. She is also the current President of her nursing Sorority, Chi Eta Phi, Incorporated which is an organization for professional Registered Nurses who provide health screenings and medical education. Denise is very active in her home parish of St Joseph’s in Wilmington. She is a Greeter, Lector, Eucharistic Minister, and a CCD teacher. As President of the Blessed Virgin Mary Sodality, she leads the women of the parish who devote themselves to the Blessed Mother and the praying the rosary before mass on Sundays, attends most funerals, and pray for parishioners suffering from any illness or death of a loved one. She is also the Head of the health ministry as parish nurse. She conducts life-saving monthly health screenings for parishioners and makes weekly visits to Baylor women’s prison where she educates incarcerated women in healthcare. In 2014, she was recognized for her service in the Diocese of Wilmington when she was honored with the Medal of Merit for Service to St. Joseph’s Church. AB Ali 2018 1080 V2 from Ursuline Academy on Vimeo.